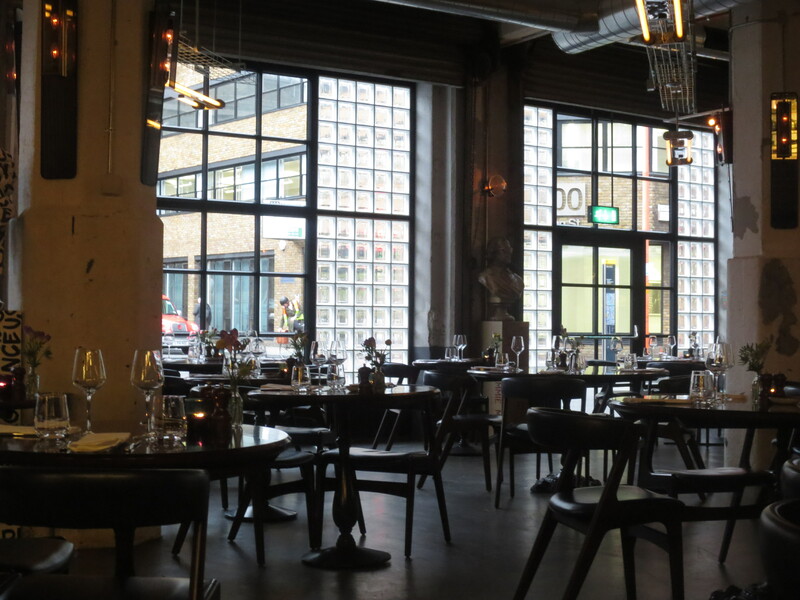 I’ve been wanting to go to the Union Street Cafe since its opening last autumn but didn’t get my act together until Top Table sent me an email last week with an offer of an early evening spring menu for £19 for 2 courses; £25 for 3. I made a unilateral decision and booked it for Annie and me tonight. Fortunately my good friend didn’t take offence at my lack of consultation and said she’d been wanting to go too. Monday isn’t the best night perhaps, especially on a wet spring evening with a cold wind blowing up, to try out a new restaurant. The walk from Waterloo station down The Cut and into Union Street is a pretty grotty one; run down rather than seedy. The restaurant itself isn’t much to look at from the outside either. But one should never judge a book by its cover so they say, or indeed a restaurant by its exterior. 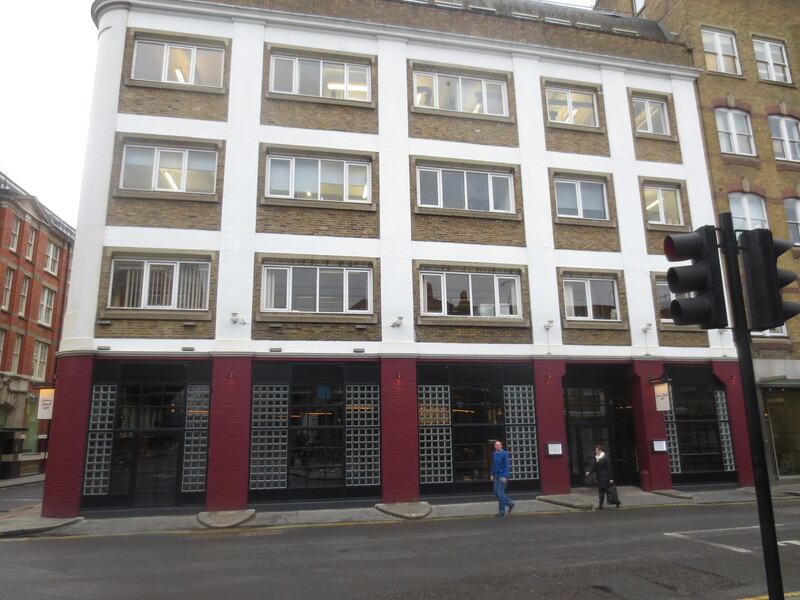 Inside, as you can see in the photo at the top, it was an attractive blend of warehouse utility and touches of sophistication. It felt comfortable; it felt like the kind of place I like to eat. And it was. Service was friendly and efficient in a perfect way. They were especially nice when I managed to knock over the small glass vase of flowers squeezing between tables to sit down and glass shattered everywhere. I apologised; they said no worries and seemed to really mean it. It did make me realise the tables were quite close together but the restaurant remained less than half full while we were there (Monday night!) so we had no near neighbours. There was a good choice on our menu – three choices for each course. There was also a large choice of wines by a 500ml carafe, which was great for us because we didn’t want to share a whole bottle. Food was chosen, wine was brought; a jug of water and some bread and olive oil. The bread was very good, as was the oil. The food is described as Italian with ‘directly sourced artisan ingredients from the Mediterranean’. 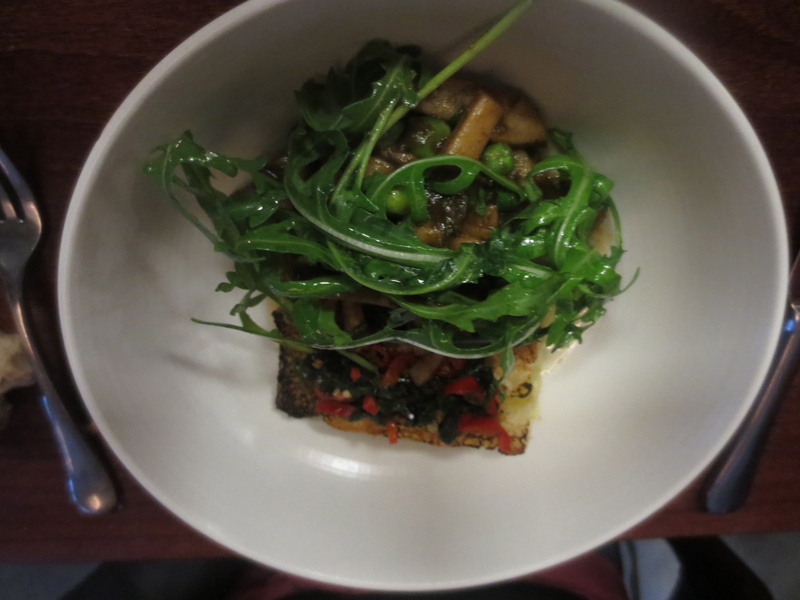 Annie chose Venetian Style Cuttlefish, Fresh Peas & Chilli Bruschetta to begin, which she said was very good. 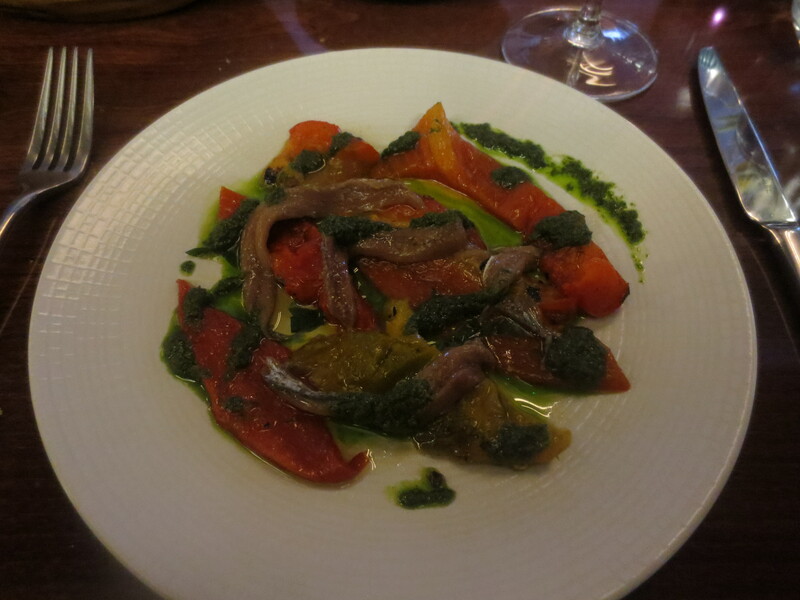 I chose Roasted Bell Peppers, Sicilian Anchovies and Fresh Garlic. I just love roasted red peppers and these were gorgeous. The bread great for mopping up the juices. The waiter laughed that he didn’t need to ask whether we’d enjoyed our starters! Our plates were clean. 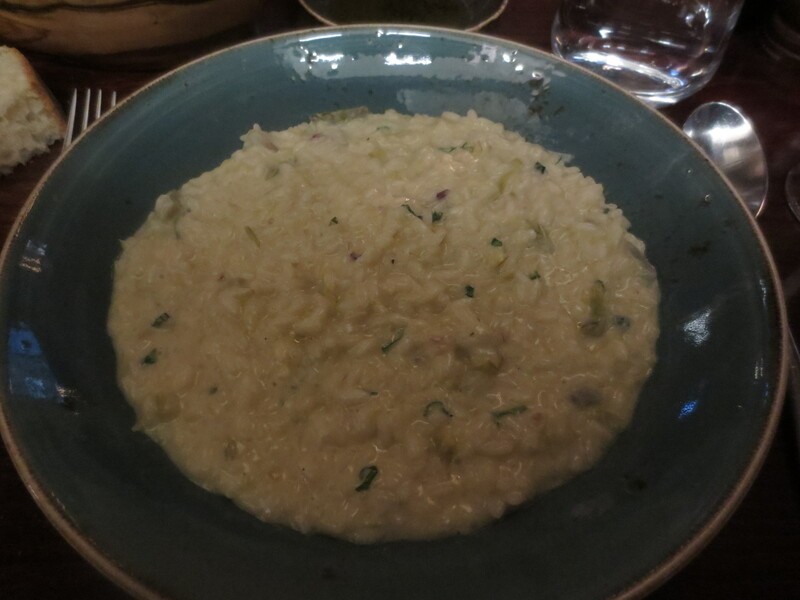 We chose the same main course: Sardinian Artichoke, Robiola & Mint Risotto. I’m so fussy about risottos; I cook them a lot myself and it makes me very critical of others’. But this was really good. We both liked it a lot. The Robiola, a creamy cheese from Piedmont, is popular as a base for sauces and it made the risotto wonderfully creamy. 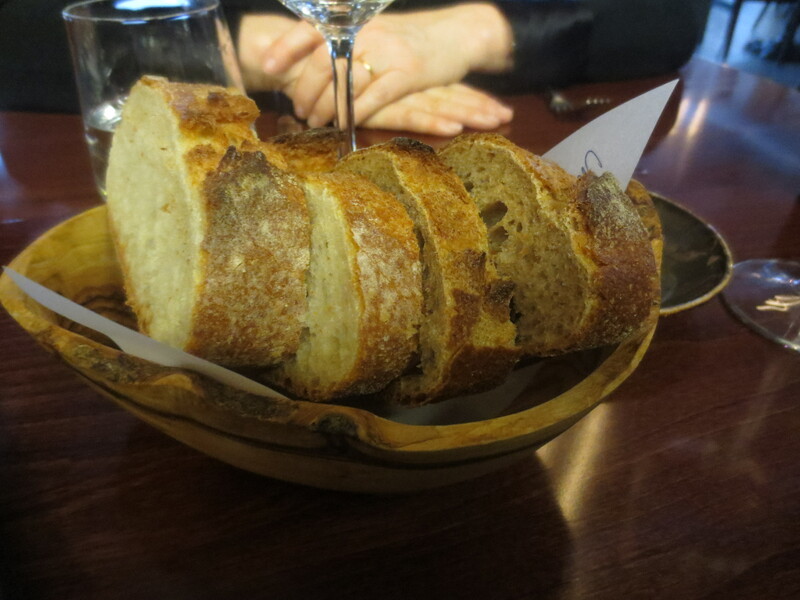 We liked the shallow bowl it came in too – a nice nod to a more rustic (if not authentically rustic) approach to cooking. This was simple food really but well done with good ingredients and a slightly sophisticated edge. Desserts sounded good but we settled on having just coffees. We sat talking till gone 9, having arrived at 6.30. Annie and I have an excellent capacity for conversation! It was a nice place to sit though; a comfortable, welcoming place to eat and spend an evening. It might not immediately strike you as the Gordon Ramsay joint it is but little touches spoke of chic and thoughtful design. We loved it and we’ll definitely go back.